Shout out to the inverse question, where the first move is down so you can't use the answers to generate additional test cases. A monadic link accepting a list of [p,q] which returns the natural number assigned to p/q. Try it online! Or see the test-suite. 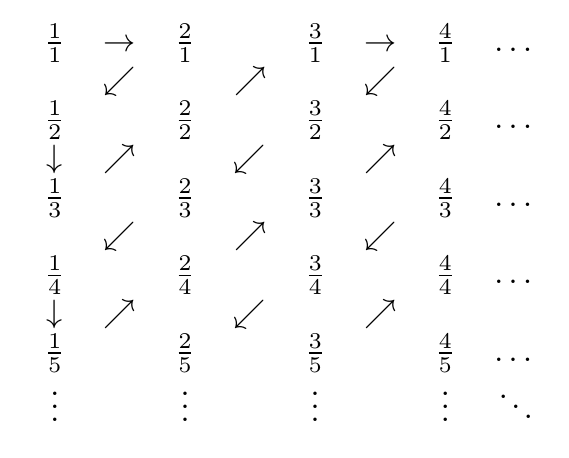 First note that the Nth diagonal encountered contains all of the grid's rational numbers for which the sum of the numerator and denominator equals N+1, so given a function which reduces a [p,q] pair to simplest form ([p/gcd(p,q),q/gcd(p,q)]) we can build the diagonals as far as need be*, reduce all the entries, de-duplicate and find the index of the simplified input. This basically generates the entire sequence of values, and stops when it finds a match. 4 bytes saved due to Mr. Xcoder; 1 byte from Jonathon Frech. Then for the main trick of this puzzle: how to 'not count' certain repeating values, like 3/3 vs 1/1, 4/2 vs 2/1, in the zig-zag trail. I ran the 1-200 examples, and noticed the difference between a plain zig-zag triangular counter, and the one the puzzle wishes for, has a pattern. The pattern of "missing" numbers is 5, 12, 13, 14, 23, etc, which resulted in a hit in the OEIS. It is one described by Robert A Stump, at https://oeis.org/A076537 , in order to "deduplicate" numbers like 3/3, 4/2, and 1/1, you can check whether GCD>1 for the x,y of all "previous" ordinals in the zigzag. This is the 'for' loops and g() which is the gcd. I guess with some builtin gcd it would have been shorter, but I kind of couldn't find one very easily (im kind of new at Rust and Integer confused me), and I like the fact that this one uses straight up integer arithmetic, and no builtins or libraries of any kind. Takes input in currying syntax (p)(q). Not the answer you're looking for? Browse other questions tagged code-golf rational-numbers or ask your own question.